There are multiple possible hair loss causes. Intended for our current and prospective patients in New York, New Jersey, and Boston, the following is a brief summary of some of the known causes of hair loss. Drs. True and Dorin have placed the causes into generally accepted categories for ease of understanding; however, this information is not all inclusive and should not be considered a substitute for consulting with a physician. Video: Why Am I Going Bald? Hair loss can result from a genetic predisposition, or repetitive trauma to the hair, such as using harsh products. Malnutrition, medicine, surgery, and other factors can also cause hair to shed. Hair loss, or alopecia, refers to any one of a number of conditions characterized by the loss of hair from the scalp or entire body. Hair loss can affect men, women, and children - although the timing and the appearance vary depending on the cause of the condition. The most common type of hair loss is male and female pattern baldness, excessive hair loss from the scalp caused by a genetic disorder which affects about 30 million American women and nearly 50 million American men. But a growing number of men and women are undergoing surgery for hair loss, thanks to improvements in surgical hair transplantation. Slow but steady hair loss on top of the head. The most common form of the condition plagues both men and women, but each gender experiences different signs of gradual thinning of hair on the top of the head. Women usually notice a widening of a part in their hair, while men notice a gradual thinning of the hair from the forehead. Round patches of thin or bald areas. 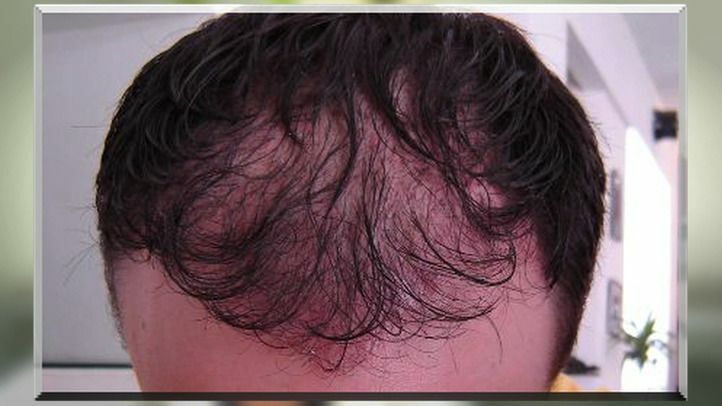 This type of hair loss looks like round, hairless patches on the scalp that typically starts with one or two patches and can develop into complete baldness. Rapid hair loss. Stress affects every person differently. 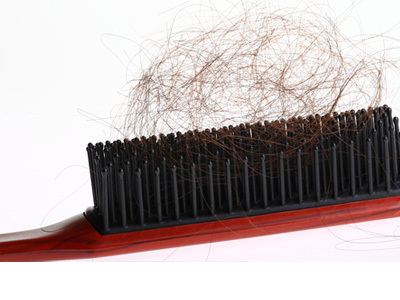 Extreme stress, trauma, or shock to the body or emotions can result in a sudden loss of hair. You might notice bundles of hair coming out while you're in the shower or when you brush your hair. In general, hair loss, clinically termed alopecia, can be categorized into two major categories: scarring alopecia and nonscarring alopecia. With scarring alopecia, the skin displays evidence of inflammation, fibrosis, and associated damage or loss of the surrounding follicles. In nonscarring alopecia, the follicles are intact and the skin does not show evidence of inflammation or fibrosis, but there is still hair loss. Both scarring and nonscarring alopecia can be sub-divided into primary cutaneous (skin) disorders and systemic diseases. Drugs can also cause nonscarring hair loss, usually by induction of a telogen effluvium (see chart below). Primary cutaneous (skin) disorders are the most common causes of both nonscarring and scarring alopecia. Our doctors encourage patients to ask questions about hair loss causes at our New York, New Jersey, and Boston facilities. Telogen Effluvium- Hair loss after pregnancy and childbirth, high fever, rapid weight loss (naturally or after bariatric surgery) and drugs. Traumatic Alopecia- Traction alopecia from constant tight braiding, overstyling, chemical relaxors, etc. IV Trichotillomania- An obsessive compulsive disorder causing self-inflicted hair pulling resulting in hair loss. In cases of female hair loss, DHT causes a slow thinning of the hair on top of the head over many years. (It should be noted, however, that the hormonal mechanisms for female pattern baldness involve more than DHT and are still under investigation.) This produces the Ludwig patterns 1, 2, and 3. Loss of estrogen after menopause adds to this effect. In rare cases, women may experience thinning all over the scalp, rather than pattern baldness. Diffuse thinning is generally not treatable with hair transplantation, unlike female pattern loss. In men, distinct and progressive male pattern baldness usually starts in their 20s, 30s, or 40s and continues for eight to fifteen years. Hair loss then slows down, but continues on a gradual and progressive course for life. Again, as in females, the result of the interaction of DHT with the hair follicles is the main cause for pattern baldness. Since men have considerably more DHT than women, our doctors presume this to be the reason for the more rapid progression of alopecia noted in our New York, New Jersey, and Boston patients. In both female and male pattern baldness, there is a gradual miniaturization of the hairs, produced by affected follicles until they eventually stop growing and fall out. This is why a person's hair will be finer in texture for several years before actual baldness occurs. In pattern baldness, the hair around the sides and back is immune to the effects of DHT. This hair is also immune to DHT if it is moved to another area of the scalp. This very concept of donor dominance explains why the results of a hair transplant are permanent. By far, the most common of the many hair loss causes treated at True & Dorin Medical Group in New York, New Jersey, and Boston is androgenetic alopecia. However, some of the other forms of alopecia can be successfully treated once the medical condition has been corrected or controlled or if the underlying issue has stabilized on its own. Androgenetic alopecia is also known as hereditary balding, androgenic baldness, male pattern hair loss, and female pattern hair loss (see classification charts below). Occurring in both men and women, this type of alopecia is progressive and results from a sensitivity of the follicles to androgens (DHT) among those who are genetically predisposed. While the age of onset and degree of balding vary, the patterns tend to be somewhat predictable. Traumatic alopecia especially affects women, and usually African-American women. Generally resulting in hair loss around the periphery of the scalp, traumatic alopecia is caused by the use of cosmetic treatments to the hair, and in particular the overuse of hair straightening tools, hair dyes, and hair permanents. In addition, constant tension on the hair follicles due to tight braiding (for example, ”corn-row” braiding) or the use of hair extensions, can lead to traction alopecia. Many hair loss treatments are available, including medication, surgery, and non-surgical options such as wigs and hairpieces. Your treatment options will depend on several factors, including type and stage of your hair loss, cost, and your general preferences. Together you and your doctor can discuss the advantages and disadvantages of each treatment to determine which is best for you. However, surgery is one of the most common solutions to hair loss. At the True & Dorin hair loss clinic, we specialize in ultra-refined follicular unit transplantation (FUT) and follicular unit extraction (FUE). Our natural-looking hair loss procedures are customized to your individual needs and goals. Dr. True and Dr. Dorin are experts in hair loss and its various causes. New York, New Jersey, and Boston area residents who would like further information or to schedule a consultation are invited to contact our hair loss practice today!